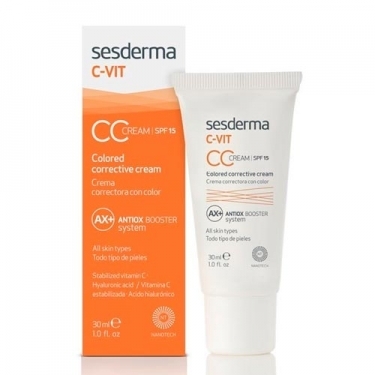 DESCRIPTION: C-Vit CC Cream SPF15 from Sesderma is an antioxidant enhancement cream with vitamin C and hyaluronic acid. It unifies the skin color and provides brightness for flawless skin instantly. Contains vitamin C encapsulated in liposomes, high molecular weight hyaluronic acid, HGH growth factor and luminous pigments. It consists of a powerful antiox cocktail with the latest generation of vitamin C encapsulated in liposomes with high penetration into the skin. Intense antioxidant action (absorption of free radicals), bleaching and anti-aging (increased collagen synthesis). It also incorporates a team of antioxidants (ginkgo biloba extract, quercetin and pterostilbene) to counteract all cell damage caused by free radicals. Each of them acts at a specific site in the cells to ensure full protection. The encapsulation in lipid bubbles of all their assets ensures a better penetration, speed and effectiveness of the formula as it allows them to reach their place of action. Apply on clean face as often as necessary until desired coverage is achieved.